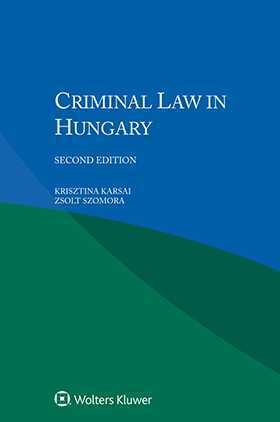 Derived from the renowned multi-volume International Encyclopaedia of Laws, this book provides a practical analysis of criminal law in Hungary. An introduction presents the necessary background information about the framework and sources of the criminal justice system, and then proceeds to a detailed examination of the grounds for criminal liability, the justification of criminal offences, the defences that diminish or excuse criminal liability, the classification of criminal offences, and the sanctions system. Its succinct yet scholarly nature, as well as the practical quality of the information it provides, make this book a valuable resource for criminal lawyers, prosecutors, law enforcement officers, and criminal court judges handling cases connected with Hungary. Academics and researchers, as well as the various international organizations in the field, will welcome this very useful guide, and will appreciate its value in the study of comparative criminal law. Chapter 2. Scope of Application of Criminal Statutes. Chapter 4. Justification, Excuse and Other Grounds for Impunity. Chapter 5. Inchoate Offences, Parties to Criminal Offences. Chapter 6. Classification and Survey of Criminal Offences. Chapter 2. Powers, Rights and Duties in the Pre-trial Proceedings. Part III. Execution and Extinction of Sanctions. Chapter 1. Sources of Penitentiary Law and Nature of Regulations. Chapter 2. General Principles Concerning the Execution of Penalties and Preventive Measures. Chapter 3. The Prison System. Chapter 4. Extinction of Sanctions or Sentences.